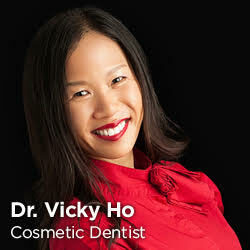 Dr. Vicky’s Smile Design Studio, formerly Smile Design Studio, is bringing smiles to everyone world. With 23 years of experience in cosmetic dentistry and a commitment to clients by giving the expected results and efficient dental care. The Smile Design Studio (formerly ADA Mosman Park Clinic) is headed by Dr. Vicky Ho and is backed by a highly skilled staff and efficiently trained, artistic laboratory technicians. All client cases are thoroughly examined, diagnosed and carefully explained to let them understand the procedure. Cosmetic dentistry procedure includes simple treatments like bleaching or teeth whitening, bonding to more complicated cases like treating misaligned teeth by way of veneers, traditional wired braces, Lumineers and Veneers to complex mouth restorations like dental implants and rarely TMJ (temporomandibular joint disorder). The videos that you see on this page are actual cases of clients of Dr. Vicky’s Smile Design Studio in Mosman Park. These videos are good sources of information or can be used as reference to a similar case that you may have. Each case is unique to every individual but somehow there is a common denominator for each case – each patients’ dental issues can be treated and will come out as natural looking as possible. You can browse thru the videos posted here for your reference and cosmetic dentistry information. Teeth Straightening - How often do I have to see the Dentist for Damon Braces? Are Damon Braces better than Traditional Braces? Which braces are better, Damon Clear or Damon Metal? Kids Orthodontics: At what age do you recommend a child be seen for braces? Braces Perth: How long do I have to wear braces to have straight teeth? What are Lingual Braces and are they better than Invisalign? Orthodontics Perth - Besides cosmetics, what is the benefit of Orthodontics?